Teams headed south on the weekend of 24/25 May 2014 for the last State Cup before SVL starts. UTS was represented in the Honours Men & women, as well as Div 1 men and women. Updates below as they come in. Having not played in any other lead-up tournaments, UTS Black were out to show that they were (almost) ready to play (and do shots!) a week before SVL starts. Having trained hard, the boys were keen to “bond”, both on and off the court, in a weekend that saw a lot of trash talk, high heels (Steve Lee! ), some vomit, the squirts, hangovers, a chunk frozen pig fat, a USA bandanna (made in China), some volleyball and gold medals. With a new line up following off-season trades, UTS Black looked on paper to be a strong outfit. With new imports Mark “Machete” Ribeiro II (aka Lionel Richie), Dan “nothing wakes me up when I am this hung-over” Gauci, Dimitri “I once drank a Bacardi breezer” Sidiropolous, Nathan “can I set?” Lovett, James “my knee is broken, but what the hell, I’ll play” McRae, as well as Gregor “my back is sore, can I play libero?” Salvin. The line-up also saw the return of Artem “let’s eat frozen pig fat and pickles” Ipatyev, Sam “can I play outside” Morrison, Andrew “I’ll show these young guys how to pay libero” Lyell, Darren “hey, I can jump serve……IN!” Hojel and finally Stu “is now a good time to move to Thailand?” Maycock. Sadly this was Stu’s last tournament for UTS as he is moving to Thailand for work wand will be sorely missed over the next 2+ years. Saturday started with straight sets wins over Illawara and last year’s SVL Silver medalists UNSW. The 1:30 pm finish, resulted in some players getting in a nap and resting well, and others clearing out the bottle shops of Wollongong. Sunday saw half the team looking healthy, and the other half much less than that. Stu, suffering a bout of gastro, warned his team mates not to use the end cubicle of the men’s toilets, unfortunately he did not warn others, as several people were seen entering that cubicle and never returning. Dan spent the morning sleeping, not on the bench, but under it! Artem managed to back up well considering he passed out at some stage with a bit of half chewed kebab still in his mouth. The Sunday morning game against Kiata was a straight forward win and the game against Westside was looking that way too until 6 errors in a row saw the Westside boys come back from 22-16 down to take the second set 26-24. To be fair, Gauci had no idea where he was when he took the court towards the end of the game, and probably has no recollection of having played at all! A fitting send-off for our Captain Stu Maycock and a very solid performance by all players. The final state cup was a great overall win for the honours girls! We stayed aggressive to take out the gold and head into SVL season with a good start. The team started off well (with Yoshi coaching) on the Saturday with 2 wins. However with Nam returning in the 3rd, Sydney Uni were able to take a set off us, ending in a draw. Unable to fix up our game and stay consistent in our attack, UNSW beat us to finish off the day. We went away from the stadium eager to rest and party and improve as a team on our ability to stay consistent and aggressive in pressure situations. What a beautiful draw the volleyball gods brought us as we slept in and had a cute brunch by the water (Irena went missing, later caught sleeping in the stadium) before going to the stadium for our first game at 2. Stronger than ever, we won our last 2 round games. Going into the final against the strong Westside girls we had to be strong in defense and serve-receive. We made sure we put pressure on their defense too by hitting high, hard and fast. Special mention to Bruna for slamming some great 1’s through the middle on the combo ball and Libby (libro) Clara for ensuring us that a ‘side-out is a side-out’. Good work team. Go UTS!!! The UTS Division 1 women’s Cougars and Cubs team made our long-awaited debut for 2014 at the State Cup in Wollongong last weekend. After a slightly rusty start at 8.30am on Saturday morning, the Cougars and Cubs somehow managed to remember how to play volleyball again by the end of the first set. Throughout the weekend, there was a steady flow of laughs (usually involving Dani Rogerson) as well as a few cat fights for the right to have a seat on the bench. This resulted in a steady rotation throughout the 4 games of the day (yes we were overjoyed when Cat finally arrived after the first 2 games). With great communication and teamwork that only comes from “experience”, we managed to make a clean sweep through Saturday’s round games without dropping a set. After a great club dinner (thanks Jess and Clara for organising) and a big night out for some, Sunday morning came and we all thought that Cat may be losing her ability to back up with no consequences after a big night. We were wrong – after a spew and a bacon and egg roll, she was all good to go. Losing Haley to soccer for Sunday’s games was really going to hurt the team, but luckily we managed to convince Yoshi to join the Cougars and Cubs for some fun – the things people agree to when they’re drunk on their one drink….LOL. We managed to take out the 5th round game 2-0 against Endeavour Academy to take us straight through to the gold medal match against Hills Dragons who came top of the other Div 1 pool. Hills Dragons proved to be a formidable opponent who somehow managed to pick up everything defensively that we threw at them. 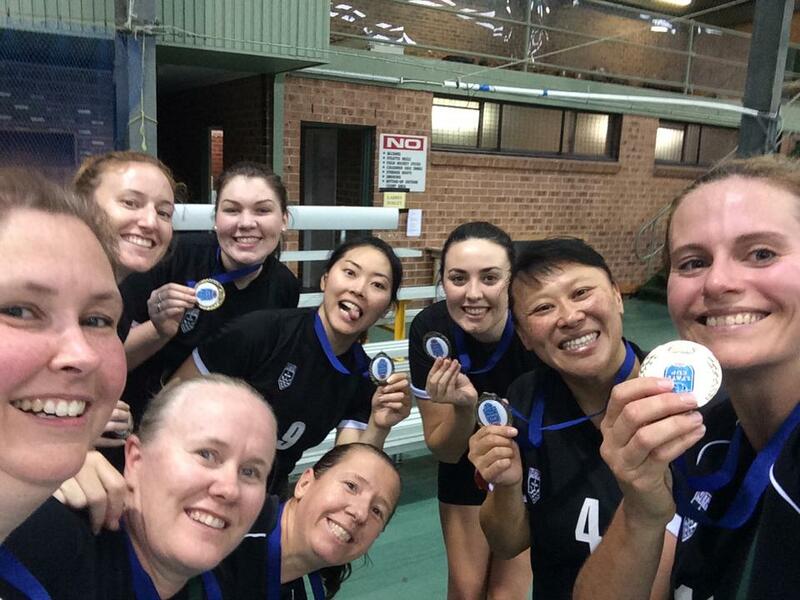 We managed to narrowly close out the first set 26-24 without succumbing to the UTS choke, but had a more comfortable win in the 2nd set to win the GOLD medal. Great catching up with the girls again, having a few beers and brownies, playing some volleyball and most importantly, having lots of laughs. Bring on SVL! Illawara State Cup was quite a disappointing weekend for division 1 and a few division 2 girls. Although we had a few very close games we just weren’t able to finish them off! For a team that has not really played together, and setters ranging from Claire, to Nat Frostick to our actual setter Lou Pow, it made for quite an interesting weekend. Hopefully next time we can all work together to achieve a better outcome. You are currently browsing the UTSVC blog archives for May, 2014.